The cast of Come From Away - Canadian Company. Photo by Matthew Murphy, 2018. 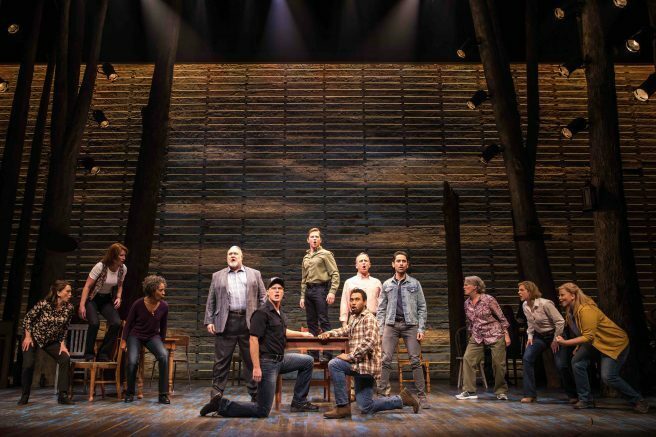 The Canadian production of Come From Away, a “Best Musical” Award winner across North America and now on stage at its new home at the Elgin Theatre in nearby Toronto, continues to play to sold out houses and thrill Toronto audiences, demanding yet another extension. Twelve more weeks of performances — 99,000 tickets — will be added from June 30 through Sept. 29 at the Elgin Theatre, 189 Yonge St. The new block of tickets is now on sale. To purchase tickets online, go to www.mirvish.com, the only authorized online source. By phone, contact TicketKing at (416) 872-1212 or 1-800-461-3333 for the only authorized phone source. Ticket prices are $39 to $169. Premium tickets are also available. Group orders of 15 or more save up to 25 percent and may be placed by calling (416) 593-4142 or 1-800-724-6420. Tickets can also be purchased in-person at all Mirvish Theatres during regular box office hours. Due to fraudulent tickets from online resellers, please note that mirvish.com is the only official ticket source for legitimate tickets. Be careful when purchasing tickets from other sources; you will be charged exorbitant prices and your tickets may not be valid. Come From Away tells the remarkable true story of 7,000 stranded passengers and the small town in Newfoundland that welcomed them. Cultures clashed and nerves ran high, but uneasiness turned into trust, music soared into the night and gratitude grew into enduring friendships. On Sept. 11, 2001 the world stopped. On Sept. 12, their stories moved us all. Come From Away features a book, music and lyrics by two-time Tony Award nominees and Outer Critics Circle Award and Drama Desk Award winners Irene Sankoff and David Hein, direction by Tony Award winner and Outer Critics Circle Award winner Christopher Ashley (Memphis), musical staging by two-time Tony Award nominee Kelly Devine (Rocky), and music supervision by Ian Eisendrath (A Christmas Story). Come From Away features scenic design by Tony Award winner Beowulf Boritt, costume design by Tony Award nominee Toni-Leslie James, lighting design by two-time Tony Award winner Howell Binkley, sound design by Tony Award nominee and Outer Critics Circle Award winner Gareth Owen, orchestrations by two-time Tony Award nominee August Eriksmoen and music arrangements by Ian Eisendrath. Be the first to comment on "Come From Away adds 12 more weeks of performances in Toronto"